I want to try something a little bit different today. I’m playing around with the idea of a new type of blog entry where I talk about what my menu looks like over the course of 3 days. There are a couple of reasons I’ve wanted to do this. The first is that I hope to give people a glimpse into what it’s like to eat as a vegetarian, more specifically a vegetarian that has lost 65 pounds and has a little more to go. I consider myself to be pretty health-conscious but with a ridiculously huge love for good food. I exercise and record my calorie intake, but I still want to eat the things I enjoy. The second reason is that while I love to cook, I want to show people that healthy eating doesn’t mean you have to slave in the kitchen for every meal. I have tons of things I eat that I throw together on the fly and don’t warrant a full recipe post. I am hoping that by extracting one slice of my diet for presentation that it can give people a more complete portrayal of what it’s like to eat at my place day-to-day. Maybe you’re already vegetarian and you’re just looking for ideas for breakfast. You could be an omnivore who wants to explore the concept of Meatless Mondays. Perhaps you’re considering a transition into vegetarianism and you have no idea where to start. Or maybe you arrived here by mistake when you Googled “monster” to get ideas for your Halloween costume (a gouda monster would be a pretty rad costume by the way). Whatever your reason for being here, I hope this turns out to be insightful and interesting for you – feedback is definitely appreciated for future entries! Exercise: 60 minutes of boot camp (I go to Texas Fit Chicks and I absolutely love it). Breakfast: (467 calories) Southwestern vegetarian tacos. I love whipping up a tofu scramble for breakfast because it’s quick, filling, and loaded with protein. In this case I ate my scramble with 2 corn tortillas, for a lower calorie alternative to flour. Lunch: (425 calories) Sandwich on ciabatta roll with a side of fruit. On this day I put hickory smoked Tofurky slices, crisped vegetarian bacon, avocado, smoked gouda, tomato and cucumber on my sandwich. Snacks & Desserts: (181 calories) 1/2 a cup of unsweetened apple sauce with ground cinnamon. 1/2 of a honeycrisp apple with a tablespoon of peanut butter. This is a pretty average gaming night for me. On Mondays and Thursdays I have scheduled game time with my bros (the fact that you can rearrange the letters in Beth Dinger to spell out The Big Nerd is no coincidence) so on these days I favor convenience in the evenings. If I’m not too limp and noodly after boot camp I love to cook tofu scrambles. Usually I will eat the scramble on its own but in this case I had some corn tortillas in the fridge that needed to be used up. You’ll notice pretty quickly that I have apples as snacks a lot. This is because they are a pretty good source of fiber, they are cheap, and they keep me full until the next meal. Also they are excellent vehicles for peanut butter. Not gonna lie… I’m mainly in it for the PB. Breakfast: (158 calories) Baked tofu (prepackaged) with a wedge of laughing cow on a sesame crispbread. Lunch: (452 calories) Sandwich on whole grain bread with baked falafel, hummus, feta, black olives, cucumber, spinach, and tomato with a side of mixed fruit. 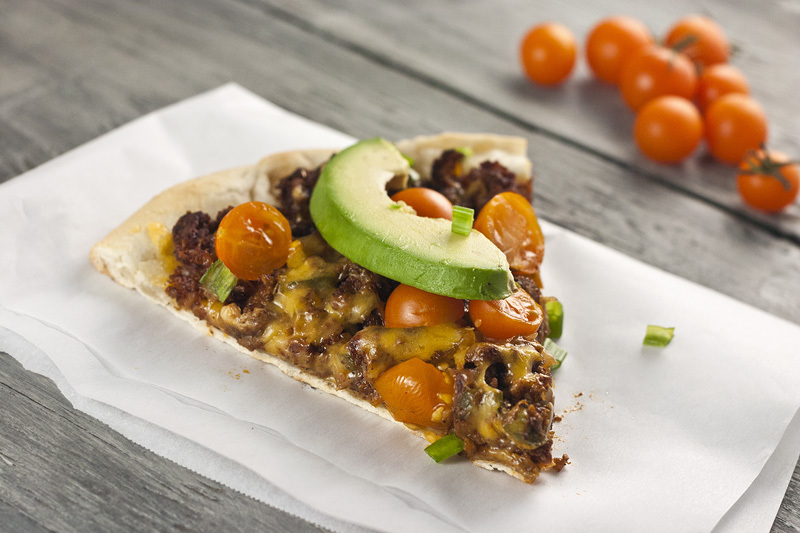 Dinner: (415 calories) Taco pizza – recipe for this one coming soon! Snacks & Desserts: (204 calories) 1/4 cup roasted cashews. Handful of red grapes. Whenever I wake up late and don’t want to spoil my lunch I will usually grab a crispbread from the fridge and slap something on top of it. Sometimes it’s peanut butter, sometimes it’s cheese, sometimes it’s rolled up tofurky and spinach. I’m a really big fan of Wasa but lately I’ve been eating the Ryvita crispbreads a lot. 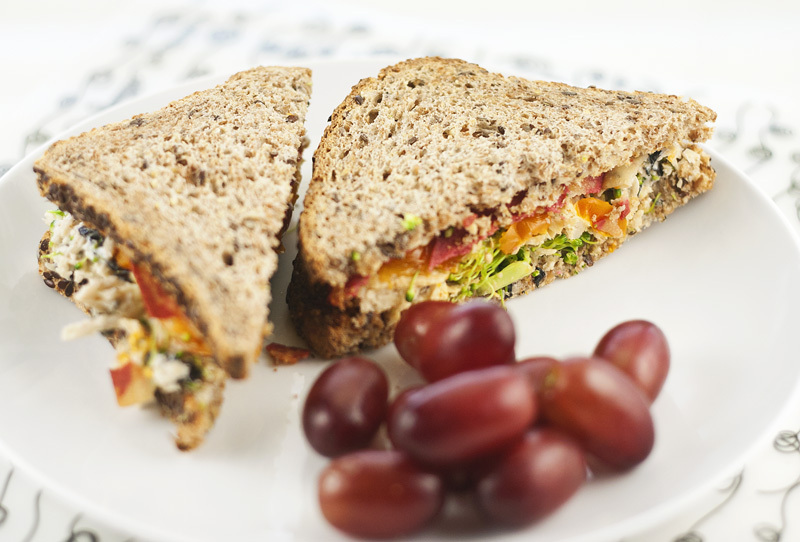 They are whole grain, low calorie, and bland enough to eat with whatever toppings you want. On the days when I don’t feel like making lunch I will go to Whole Foods. I’m probably there once or twice a week for lunch these days because they have a really nice spread with tons of veggie-friendly and health-friendly options. Dinner was a huge hit and I can’t wait to post the recipe in a day or two. I made a taco pizza which is easily made vegan by omitting the cheese or using Daiya. Exercise: 60 minutes of boot camp. Breakfast: (349 calories) Ciabatta roll with vegetarian breakfast sausage, cheddar cheese, and a side of red grapes. Lunch: (568 calories) Agedashi tofu, an avocado sushi roll, and an asparagus tempura roll. Dinner: (434 calories) Individual egg-free broccoli cheddar quiche with side salad. 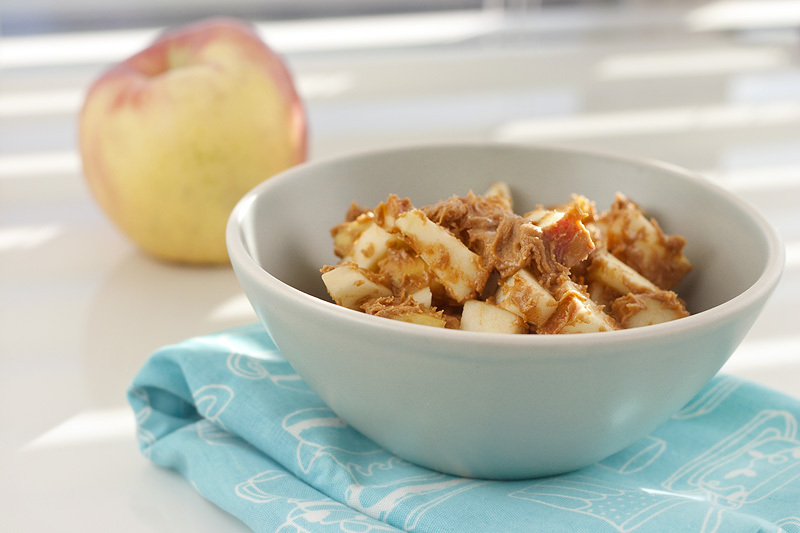 Snacks & Desserts: (262 calories) 1 honeycrisp apple cut into bite sized pieces and tossed with 2 tablespoons of reduced fat peanut butter. Breakfast was a super quick affair that involved microwaving a frozen sausage patty for a minute or so and throwing it on a roll with a little cheese. I have a lot of no-plate meals that I enjoy when I don’t want to dirty up dishes and this is one of them. The sushi lunch listed here is amazing but it’s a little higher calorie than I usually allow for myself on a weekday. Given that I had boot camp in the morning I gave myself a little wiggle room in this area. I probably eat here once a week now – definitely at least once every two weeks. If you want to try your hand at making an egg-free fritatta with tofu you should definitely check out the recipe at Fat Free Vegan. For dinner I modified this recipe a fair amount, stirred in sauteed broccoli and cheddar cheese, and poured it into small ramekins prepared with little quiche crusts. As you can see from this small overview… my diet is not flawless. I usually restrict my overall carbohydrate intake in favor of a little more fat in my day and it’s pretty rare for me to stay under my sugar budget. Despite these things I have still managed to lose almost 30% of my body weight over the past two years. Obviously this is where I have to spout out all of the junk about how I’m not a nutritionist, that you should consult your doctor before undertaking any dietary changes, blah blah… we all know that stuff by now right? I can only tell you what has worked for me and I can only try my best to emphasize that losing weight doesn’t have to be a miserable struggle of grapefruit halves and cabbage soup. More than anything it’s about balance and moderation. My mantra has always been that slow and steady wins the race. And sometimes sweet and salty.